Loraine was one of four children, along with her brothers Royal, Jack and Paul. 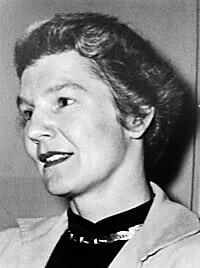 She graduated from the University of Oregon where she met her husband, Robert Gordon Vosper. They married in Glenns Ferry on August 20, 1940, and raised their four children, moving from Berkeley, California to Pacific Palisades, California, and then to Lawrence, Kansas, where her husband had been recruited in 1951 by Chancellor Franklin D. Murphy to serve as director of Libraries at the University of Kansas. In 1961, Chancellor Murphy, newly appointed as chancellor at UCLA, persuaded Mr. Vosper to serve as University Librarian at UCLA, and the family moved to Westwood, in Los Angeles. Loraine was an avid reader, cook, hostess, seamstress and gardener. She loved to travel and often learned the languages of the countries she planned to visit. She hiked the highest peaks in Yosemite and swam daily at the UCLA pool until she was in her eighties. Loraine is survived by all her children, Ingrid McCarroll, Kathy Katz, Elinor Charles and Stephen Vosper, as well as eight grandchildren and two great-grandchildren. Charitable contributions can be made to the Kansas University Endowment Association, for the KU Libraries, to benefit the work of The Vosper Society, the group of benefactors and advocates which promotes excellence at the KU Libraries. See: www.kuendowment.org/givenow.